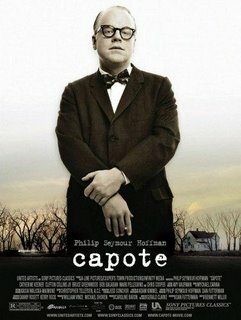 The opening sequence of first-time director Bennett Miller’s Capote is of a quiet farmhouse in Kansas. A teenage girl walks into the house only to discover that her best friend has been brutally murdered. Meanwhile, in New York City, author Truman Capote (Philip Seymour Hoffman) is doing what he does best: drinking, partying, and telling stories. The next morning he opens The New York Times and reads about the murder of the Clutter family in Kansas. He decides that this will be the focus of his next piece for The New Yorker. Along for the ride is the always magnificent Catherine Keener as Harper Lee, the author of To Kill a Mockingbird. She joins her childhood friend as a research assistant and is the person who keeps him grounded. To say that Capote is just a good movie would be a major understatement. Philip Seymour Hoffman dives into the role of Truman Capote head first and delivers the greatest acting performance in recent years. From his voice and insecurities to his facial expressions, sense of humor and undeniably charming personality, Hoffman nailed the eccentricities of Truman Capote. While this movie is about a brilliant author and his landmark literary achievement (In Cold Blood was the first nonfiction novel), it is also about Truman Capote’s faults and unlitmate demise. The author develops a close relationship with convicted murderer Perry Smith (played perfectly by Clifton Collins Jr.) and this relationship becomes the death of Capote, figuratively and literally. After the publication of In Cold Blood, Capote never completed another novel. Watching Philip Seymour Hoffman portray this literary icon in the best years of his life entering a sudden decline is a treat to watch. It is safe to say that Hoffman will win the Best Actor statuette.